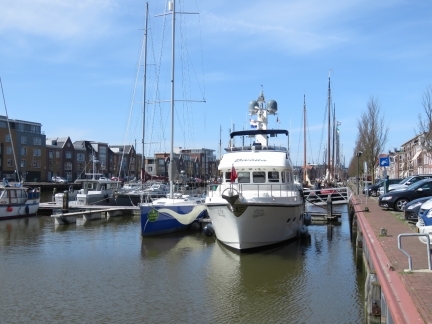 From London we made a 267-mile run to Harlingen, NL to pickup our new tender before continuing on to Norway. We spent a peaceful night anchored at Stangate Creek near the mouth of the Thames before making an overnight run to Harlingen so that we would arrive in the morning on a rising tide. Except for a thick fog that persisted well out into the North Sea, the run from Stangate Creek to Harlingen was easy and relexing in calm condtions. 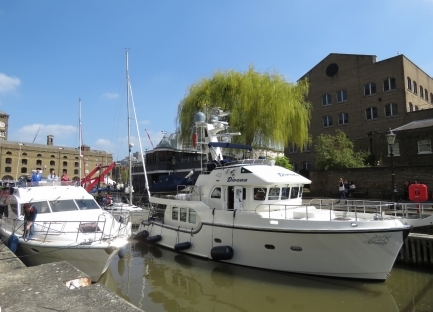 In the lock with three other vessels as we depart St. Katharine Docks. The two months since our February 10th arrival have flown by—we had a fabulous time in London. But the next adventure in Norway beckons. 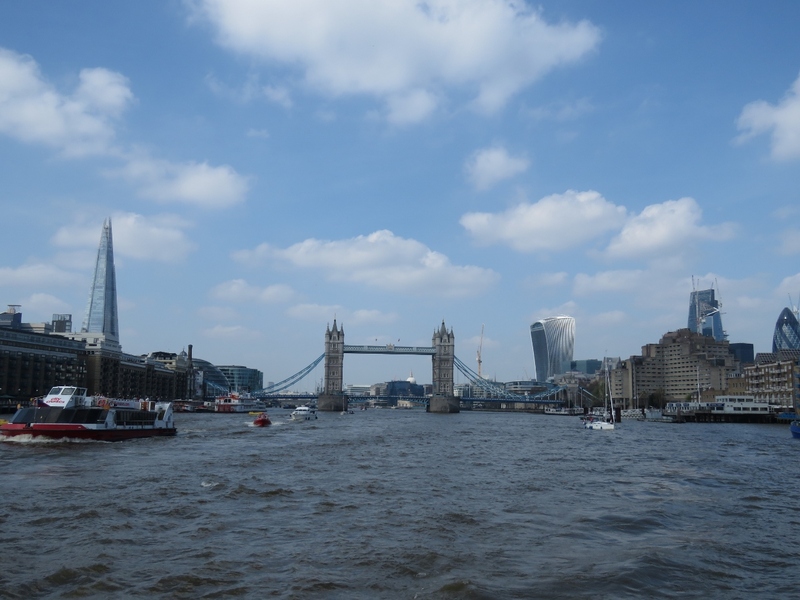 A last view to Tower Bridge and downtown London as we head down the Thames. There’s a lot more traffic on the river than when we arrived. Partly it’s daylight on a Saturday, but also traffic is picking up as the summer tourist season gets into swing and more pleasure craft are about. 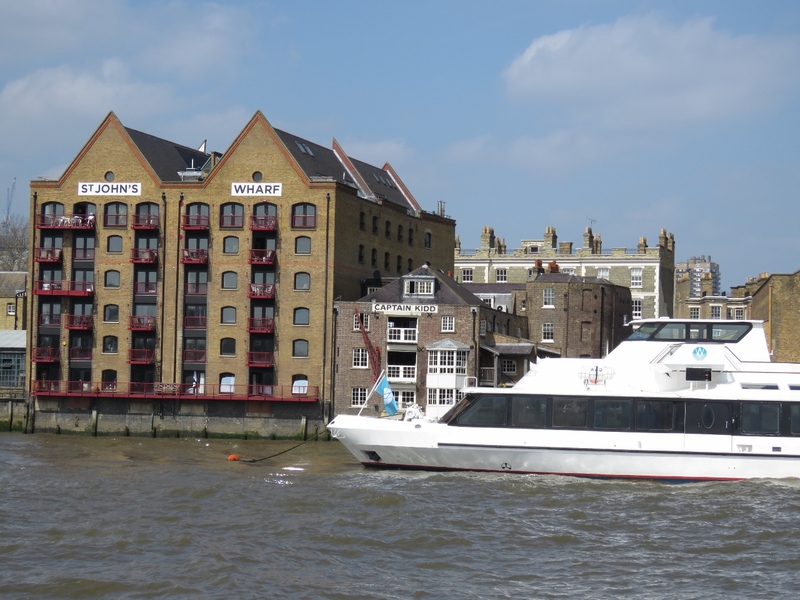 The waterside of the Captain Kidd pub that we visited several times while at St. Katharine Docks. 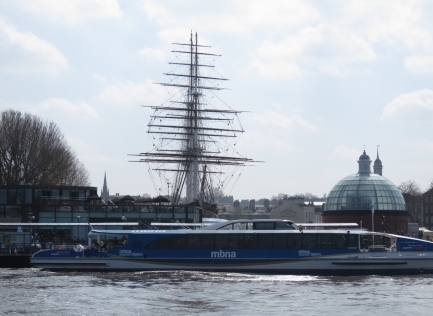 Passing the high-speed ferry dock at Greenwich in front of the Cutty Sark, the last of the great 19th-century tea clippers to sail between England and China. The cable car to Greenwich Peninsula that we took to visit Greenwich. 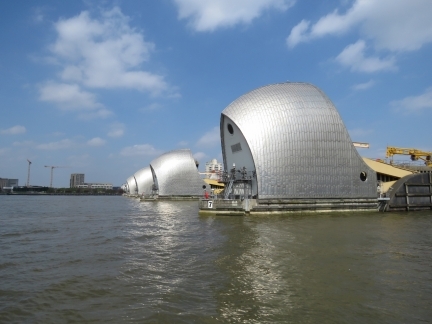 The Thames Tidal Control Barrier protects the Greater London area from flooding due to high tides and storm surges. It has semi-circular gates that lies on the river bottom and rotate into place when needed. 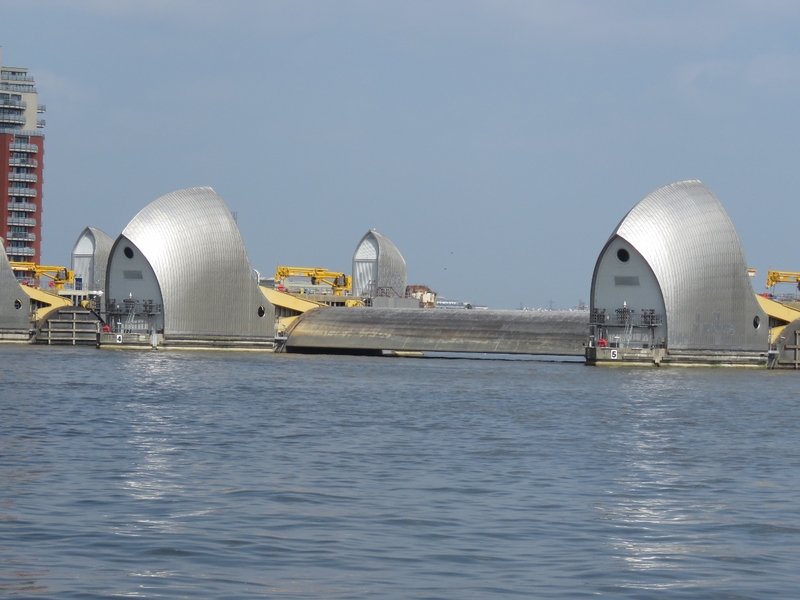 One of the gates was up when we passed, presumably for maintenance. 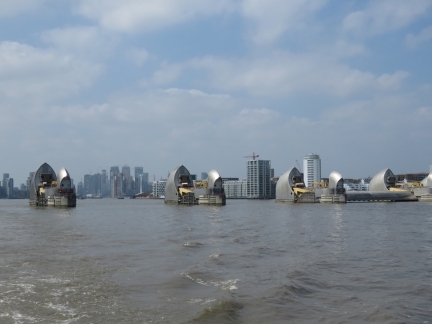 Passing through the Thames Tidal Barrier. Our last view to the high-rises of Canary Wharf through the Thames Tidal Barrier as we depart London. The Royal Iris went into service in Liverpool in 1951. It was used as both a ferry boat and hired out for cruises with local bands such as the Beatles providing entertainment. 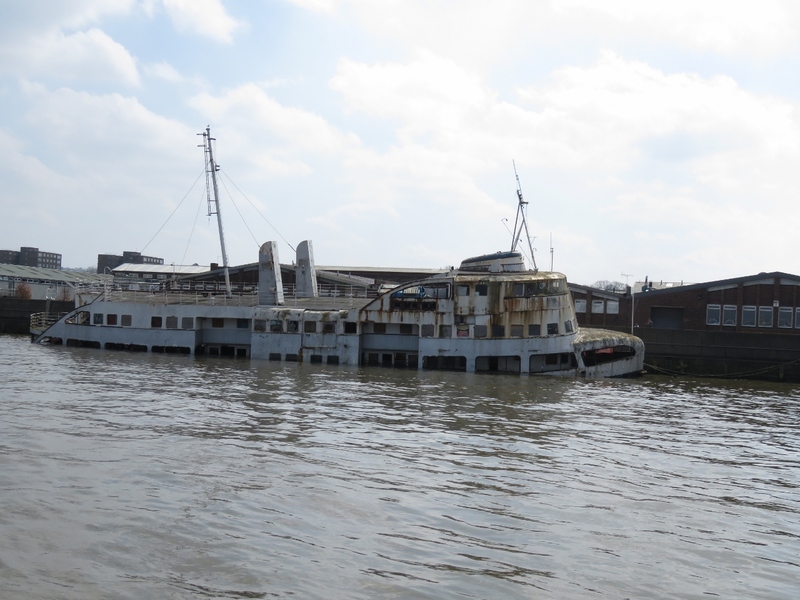 The ferry was retired in 1991 and towed to London in 2002 where it was left derelict and began taking on water. 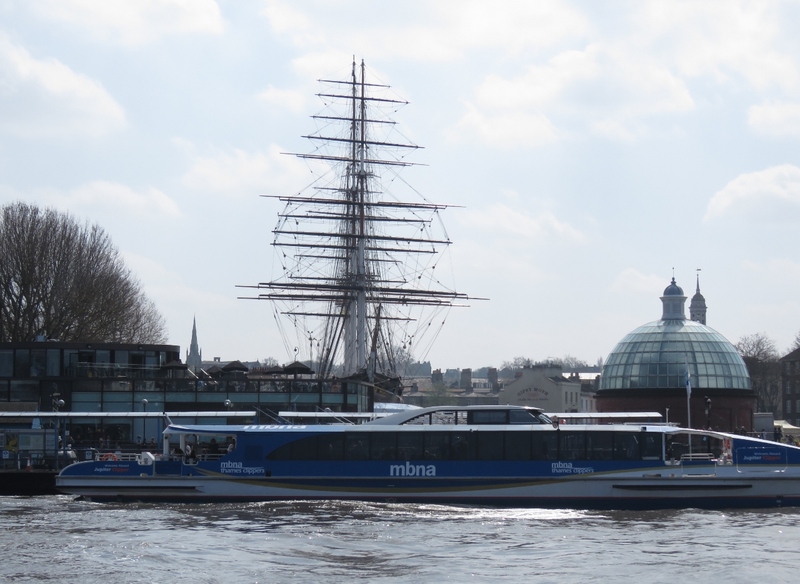 It now sits on the bottom, secured to the embankment and partially flooded at high tide. The Gravesend pilot boat Patrol passing close off our stern. 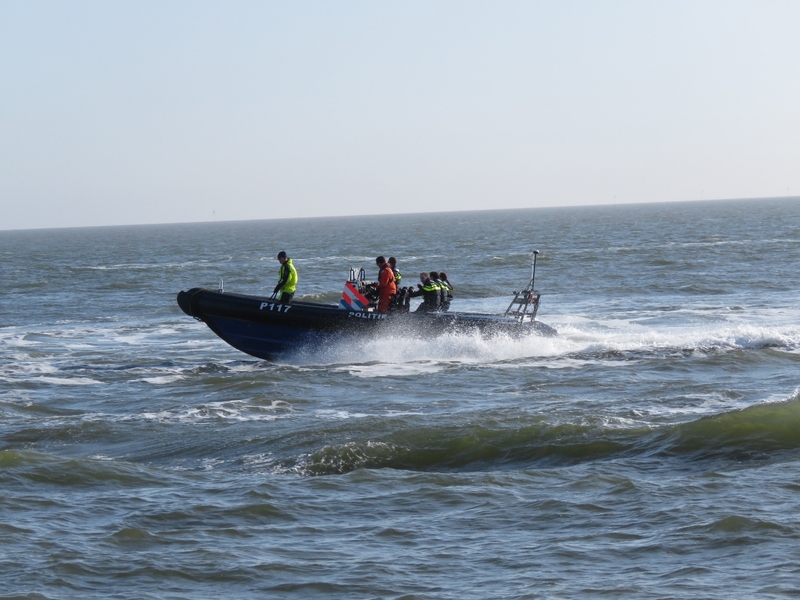 The vessel came off its dock on shore and ran parallel to us closer than we were comfortable with and then turned 90 degrees directly towards us. If we’d stopped or slowed, the boats would have hit. 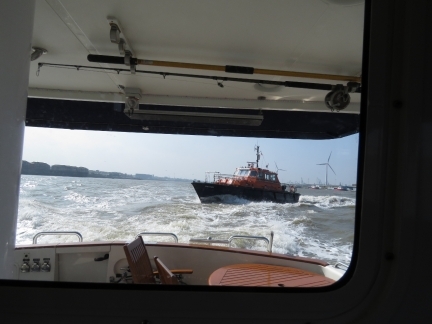 Even at the over 10 kts we are currently running, the pilot boat barely passed to our stern. 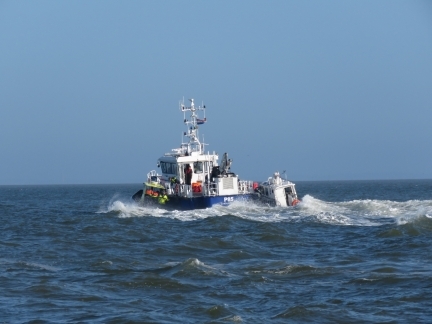 This seems like an unnecessary risk for an overtaking vessel—it’s a big river, there is lots of room to maneuver with boats as small as Patrol and Dirona, and radio communications would have been easy. We’re smoking downriver with a big push from the current and making 12.5 knots. At 2,200 RPM we’d expect to do about 9 knots. We’re running under a little more power than usual, curious how fast the combined effect of current and more power could push us downriver. 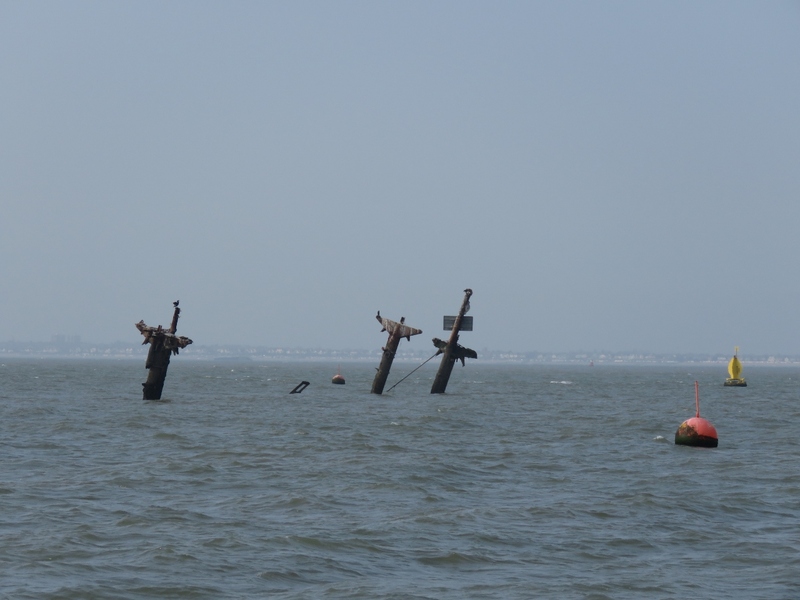 The wreck of the Richard Montgomery at the junction of the rivers Thames and Medway. 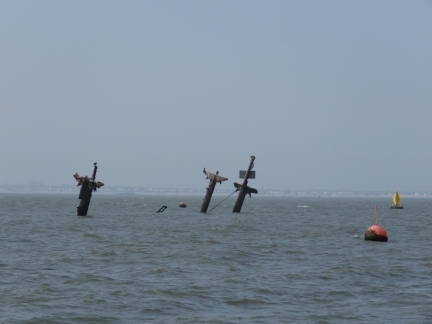 The Richard Montgomery was an American Liberty ship that sank here in 1944 with a cargo of munitions. 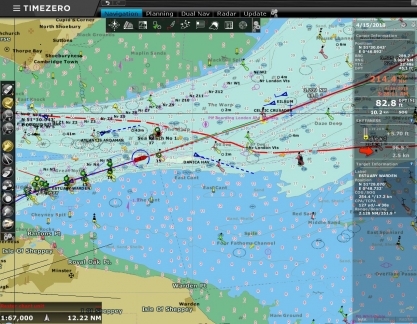 The wreck is surrounded by buoys and well-marked on the chart as an exclusion zone due to the danger of the unexploded munitions. Beautiful tractor tugs moored off Garrison Point at the mouth of the River Medway. The fort on the left was built in the 1860s as defense against a possible French invasion. 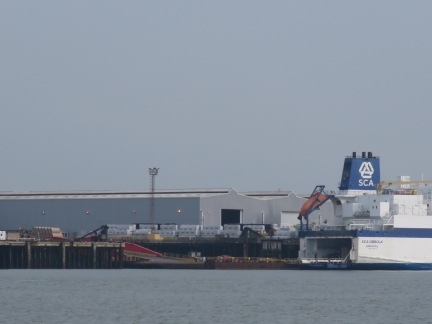 Rolls of paper being unloaded by truck, at left, from the SCA Obbola at the Port of Sheerness. 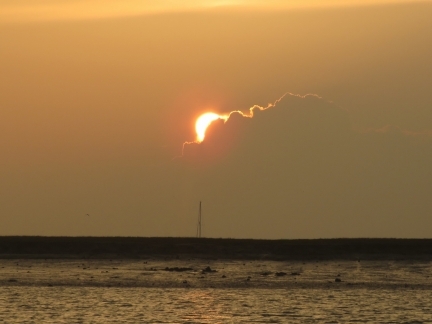 We spent a lovely evening anchored at tranquil Stangate Creek, a recommendation from Helen and Gus Wilson. 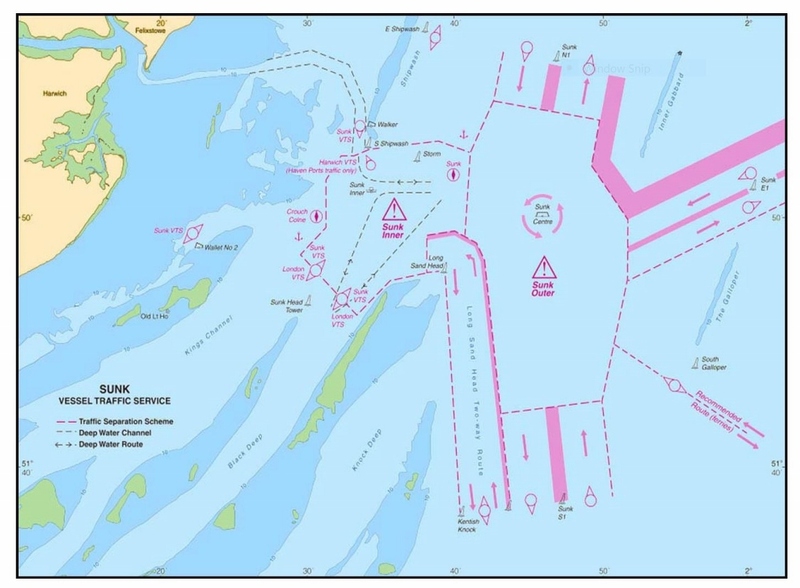 We’d anchored briefly at Portland Harbour in January, but this was our first overnight anchorage since the Isle of Gigha in Scotland way back on October of last year. 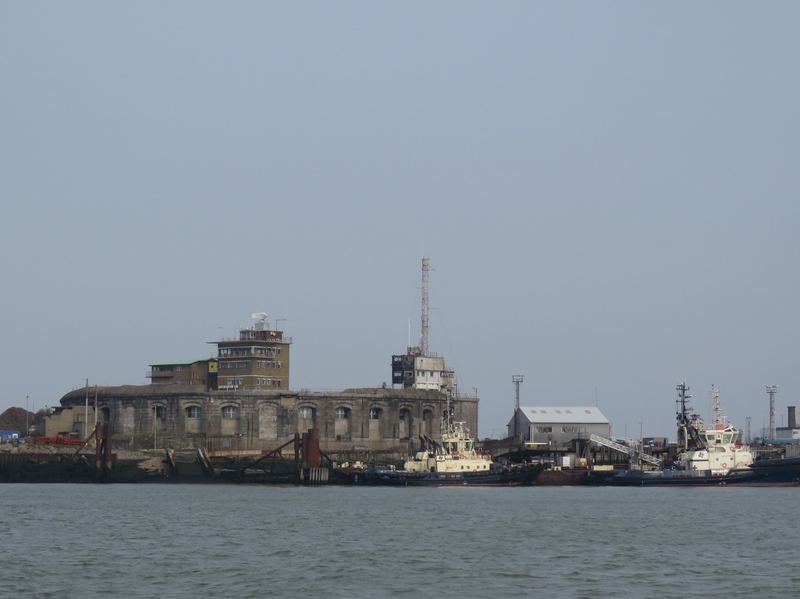 Although we’ve enjoyed our city time, it was wonderful to back on the hook again. 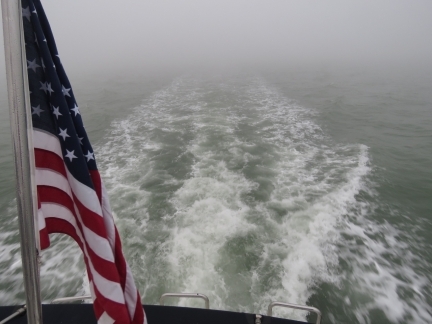 Visibility was barely a hundred feet in thick fog this morning as we departed Stangate Creek for the Netherlands. This was the view from the helm for most of the day. 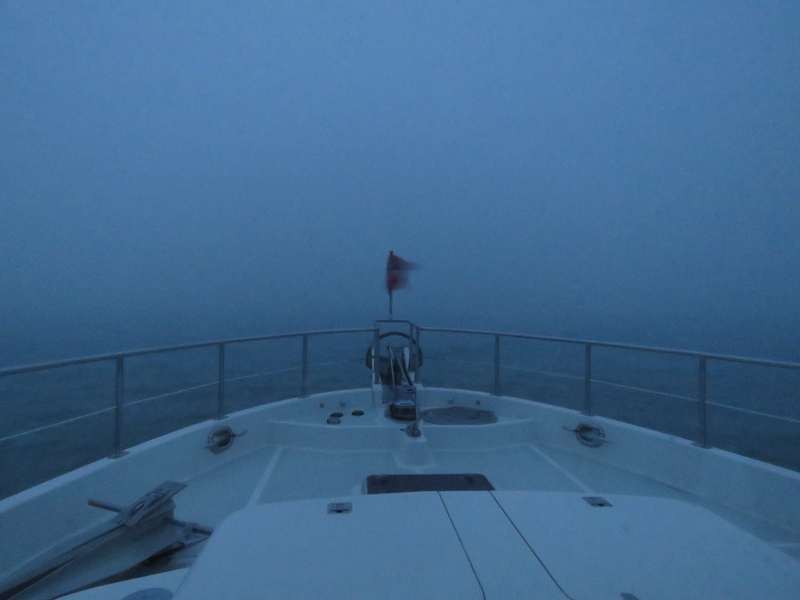 We departed before sunrise, at just past 4am, to pick up the ebb tide and currently are doing 10.2 knots. Normally at 2000 RPM we’d be doing about 8.4 knots. We’re seeing lots of ship traffic as we enter the River Thames. The squiggly red line is our track into London and the straight red line is our route out. 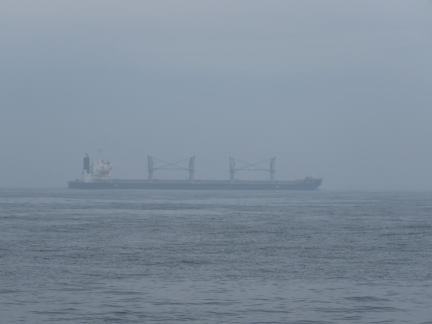 We were hoping for improved visibility as we got further from shore, but no such luck. On the upside, conditions are wonderfully calm. The windmills of the London Array Offshore Windfarm are visible on radar, but we can’t see anything in the thick fog. The first phase of the array, completed in 2013, produces 630 MW with 175 turbines. 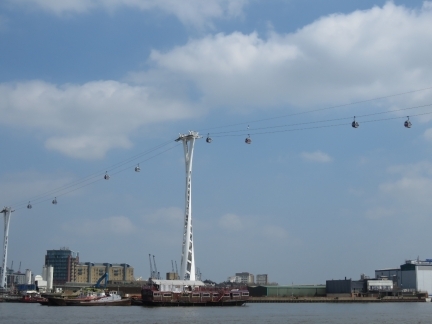 A second phase was planned, but wasn’t approved due to concerns over sea bird impact. The tide has now turned against us and we’re making less than 6 knots at 1970 RPM. And we’re still in thick fog. 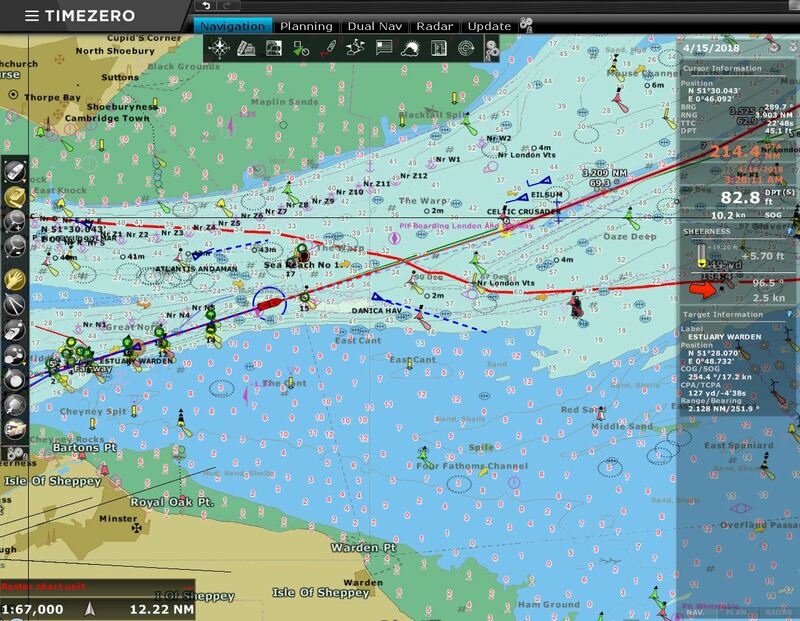 This is a screen shot from the US National Geospatial-Intelligence Agency’s Sailing Directions Enroute for the North Sea showing the Sunk VTS area that controls the outer entrances to the rivers Thames and Medway and the port of Harwich. 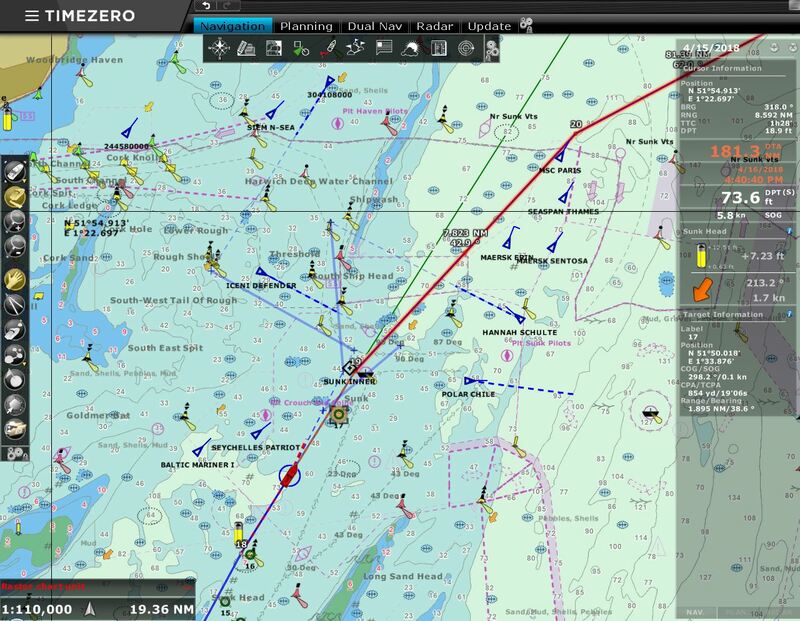 The Sailing Directions primarily are aimed at commercial traffic, but we’ve found them quite useful world-wide in supplementing the charts, and particularly for VTS information. The Sunk VTS area looks straightforward enough on the Sailing Directions diagram, but the area feels a lot more complex when overlaid with chart data and lots of AIS traffic. James is wanted to move our standard Maretron DSM configuration to the DSM 410 we will be using on the tender. But since the DSM 410 is a fairly new piece of equipment, it was not recognized by any of the existing DSM 250s and DSM 150s on Dirona. 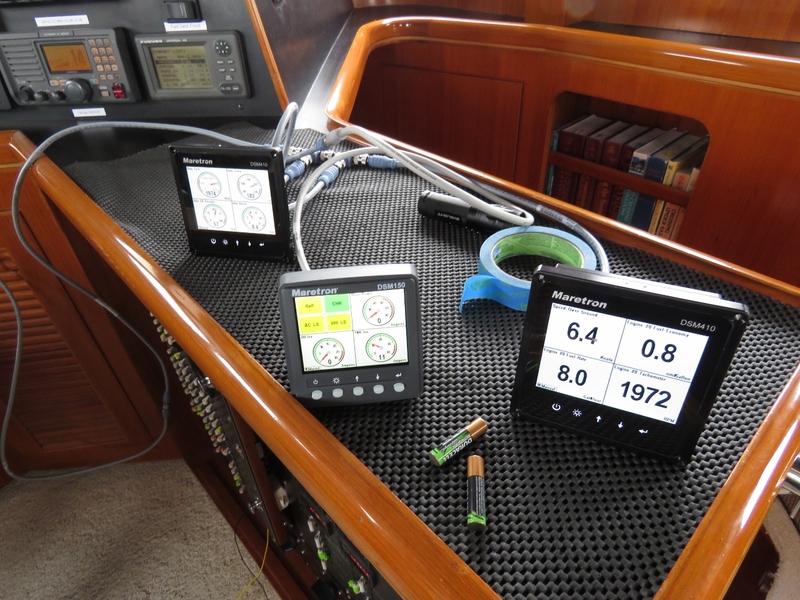 We first had to flash the older products and then transfer the config to the DSM 410. While at it, we took the opportunity to flash all Maretron devices in the Dirona NMEA2000 network and do our spares as well. 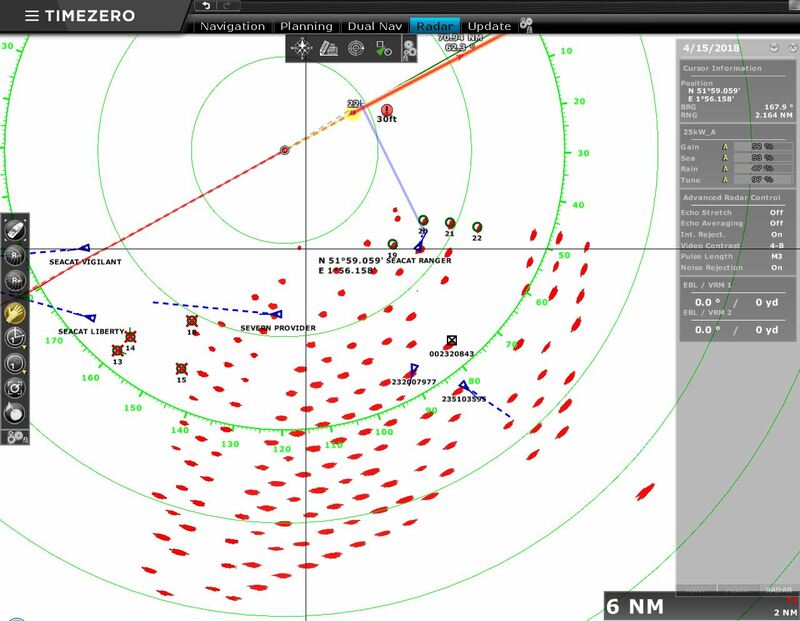 As with the London Array, we can see the Greater Gabbard windfarm on radar, but it’s invisible to us in the thick fog. The 504 MW farm was completed in 2012, with a 336MW extension expected to be completed in 2018. 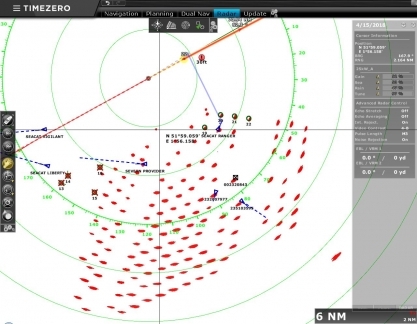 The large number of AIS targets in the area of the farm likely is due to that construction. 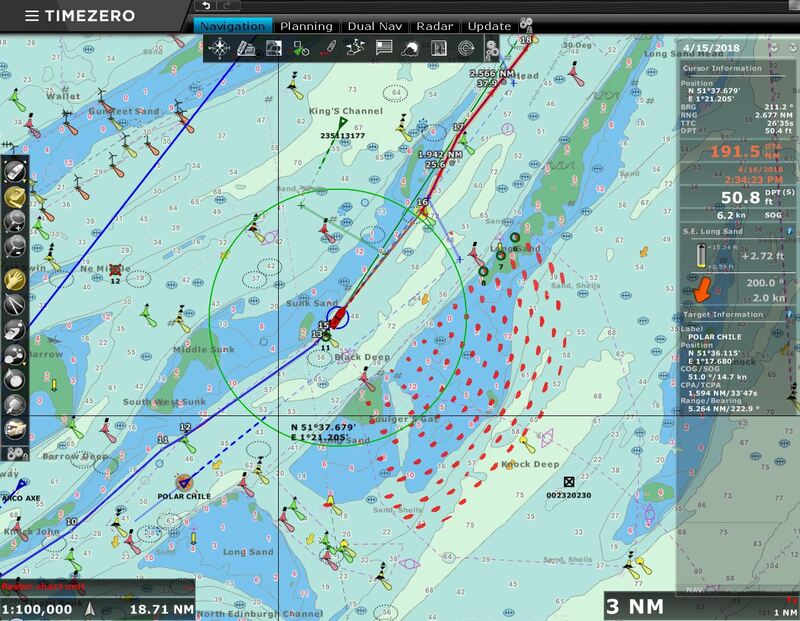 We’re back in some positive current now and are doing 9.1 kts. Visibility finally is improving and we can actually see one of the AIS targets we’ve been tracking. 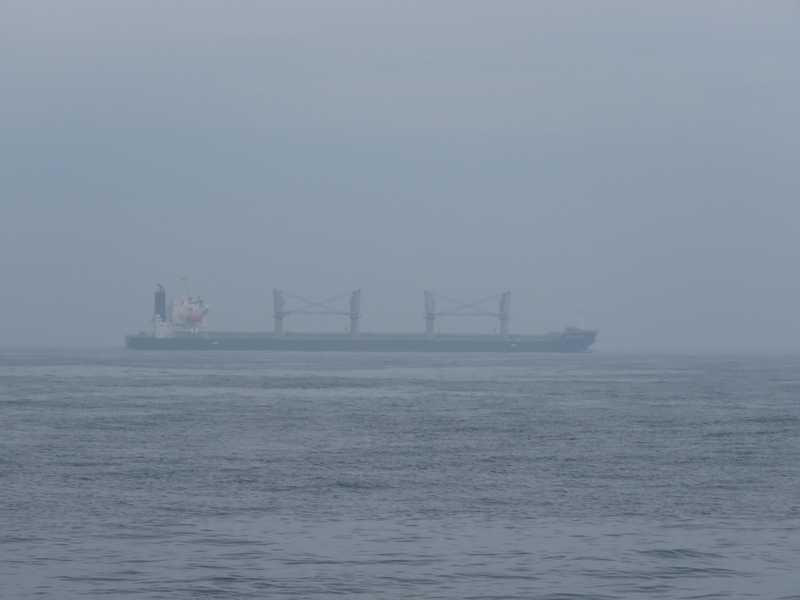 This is the 575ft (175m) bulker Sedna Ocean, just over a half-mile away. 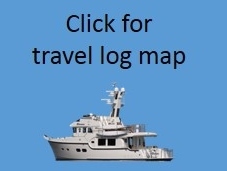 We reached the mouth of Vliestroom channel 8:30am the morning after we’d departed Stangate Creek in the UK. 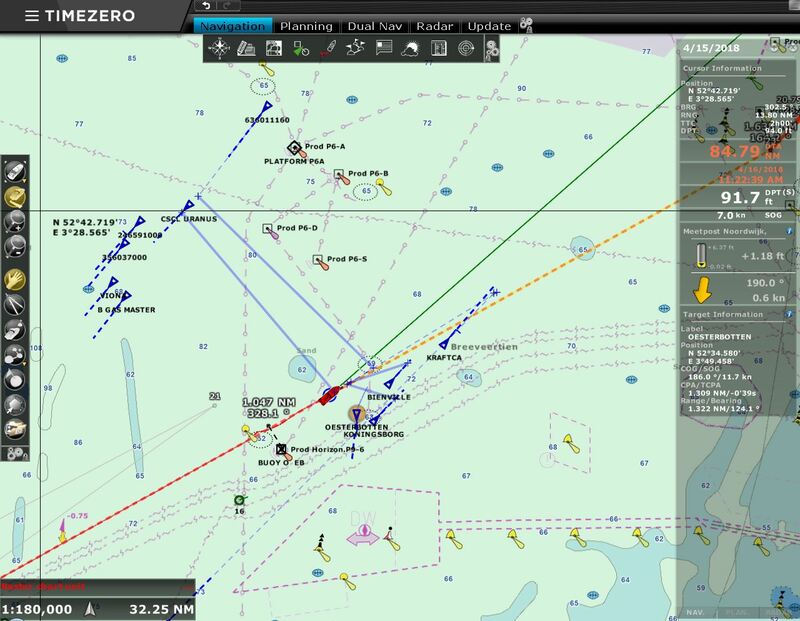 It’s a busy channel with lots of traffic. 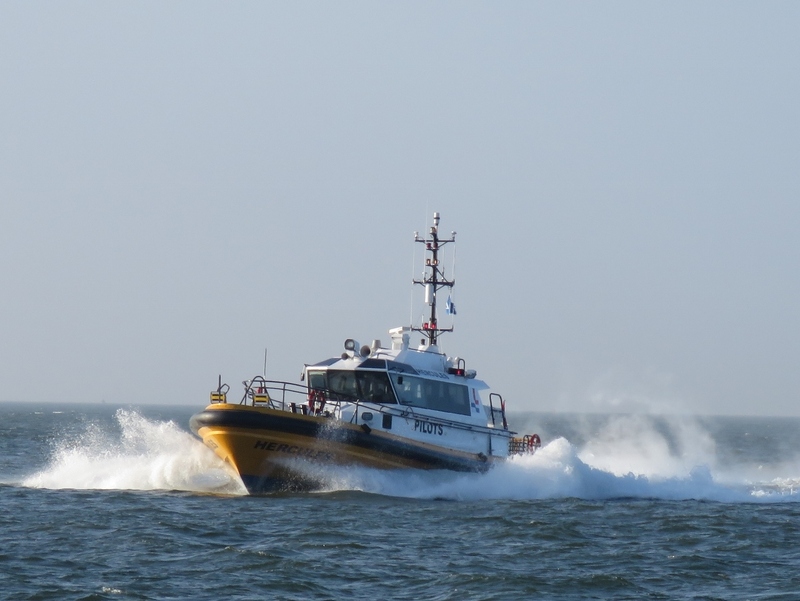 At least two dredgers were operating in the distance and this pilot boat was the first we passed in the channel as we headed in from sea. The high-speed catamaran Tiger followed shortly after the pilot boat. 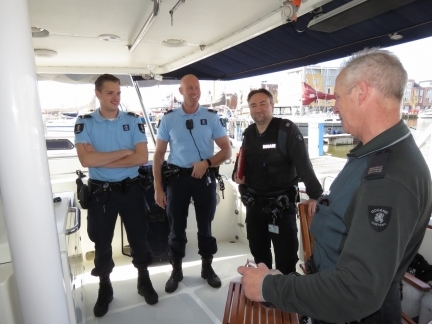 As we neared Harlingen, a group of several police boats approached at speed, heading out on a training mission. 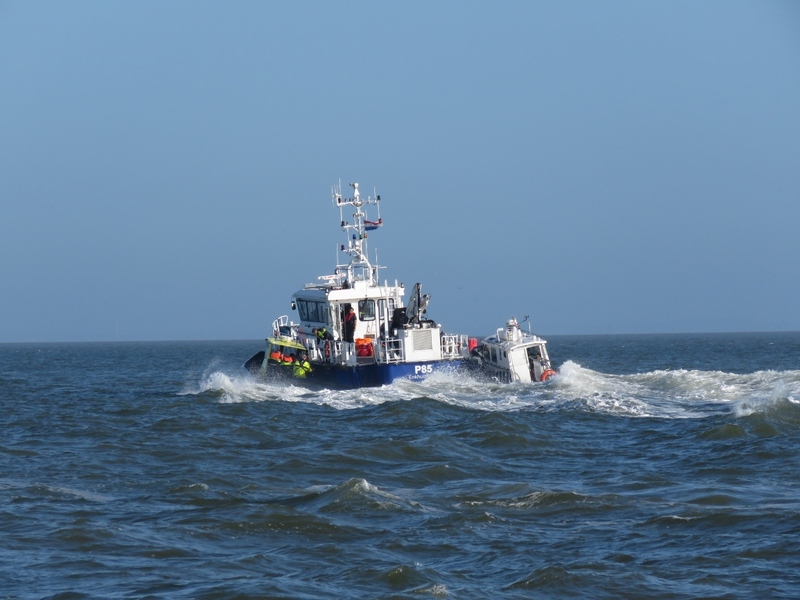 This Politie (police) boat circled us, taking a good look. We expected they would approach and question us, but they continued on with the rest of their group. 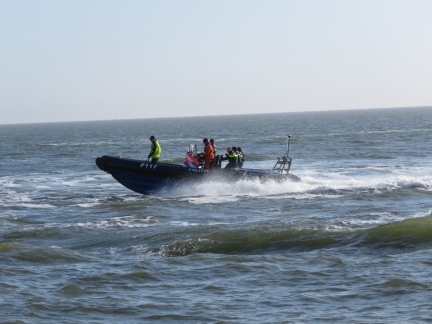 But they radiod into their shorebound colleagues who were ready for us when we arrived. 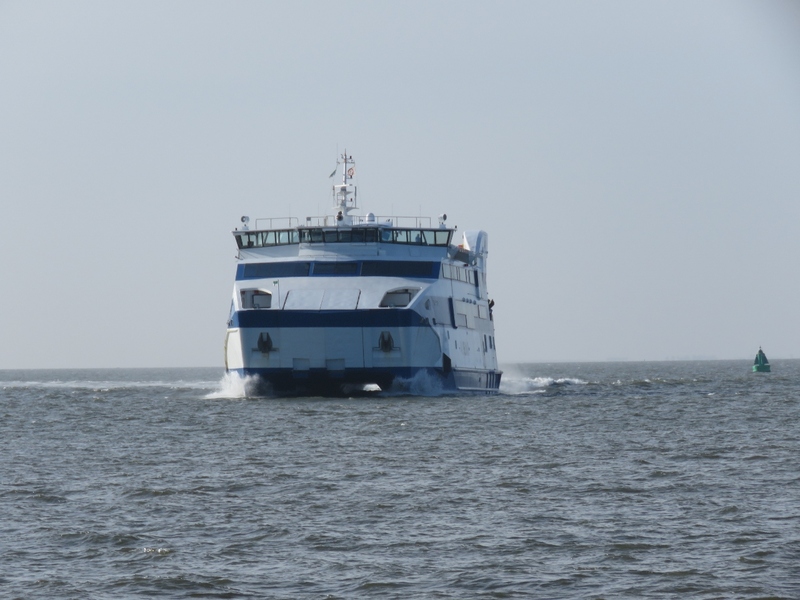 Another ferry departing Harlingen as we neared the harbor entrance. The waterway is busy enough that a separate channel for pleasure craft has been marked out along the south side. But the controlling depth of that channel is only 1.8m and we draw 2.1m, so we’re using the main waterway. 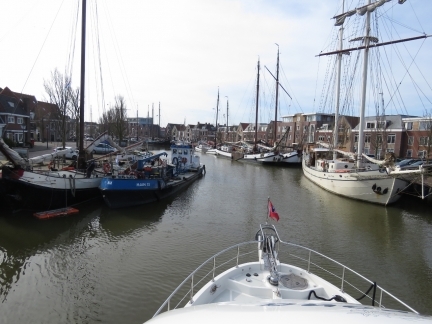 Dirona in the Port of Harlingen about to pass through the first of two bridges to reach Oude (Old) Buitenhaven. 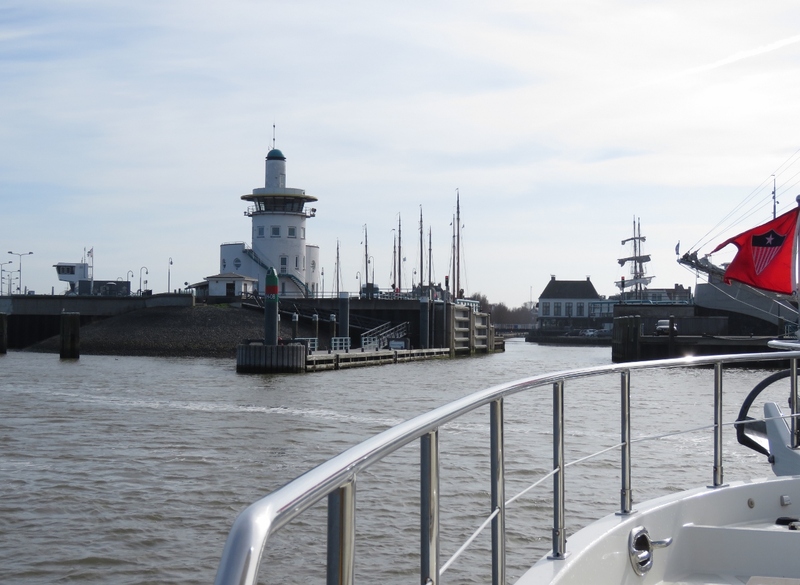 Entering Zuiderhaven, one of two basins with designated pleasure craft moorage in Harlingen. 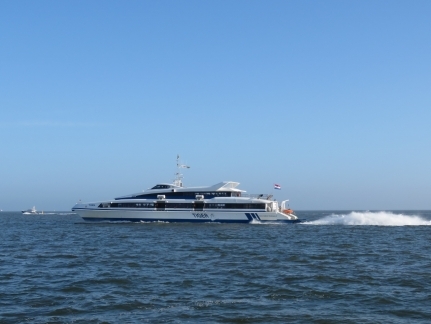 Large canal boats are rafted on either side, and the one on the left is being fueled, making entry a little tight. The police boats we’d passed earlier had noticed our American flag and informed Immigration (left) and Customs, who arrived shortly after we’d docked. For Customs we just needed to show them our 18-month EU temporary import paperwork we’d received for Dirona in Ireland. But this is our first entry into the Schengen Area, so we needed James’ passport stamped. (Jennifer is an EU citizen, so her passport isn’t stamped.) We can now travel throughout the Schengen area, which includes Norway, without requiring further Immigration clearance. Moored in the one of the two pleasure craft marinas in Harlingen (the other is in the north basin). Medieval Harlingen got city rights in 1234, making it older than Amsterdam which didn’t get city rights until 1300. The basin we are in, Ziuderhaven, dates to at least the 17th century.